Are you tired of feeling self-conscious about your crooked teeth? You have probably considered orthodontics in the past but feel that metal wires and brackets will only add to your insecurities. Now, you can get the straight, confident smile you have always wanted using a nearly invisible option. With Invisalign in Columbia, you will correct the alignment of your teeth using a sophisticated treatment so you no longer need to feel embarrassed. Braces have been used for more than 100 years because they are effective for resolving even the most complex bite and alignment issues. By attaching metal wires and brackets to the teeth, they are gradually pulled into position. While this is an affordable and effective solution, they are quite noticeable and there are several disadvantages to the treatment. Invisalign resolves the hassles often associated with the traditional orthodontics. Invisalign does not use any wires or brackets. 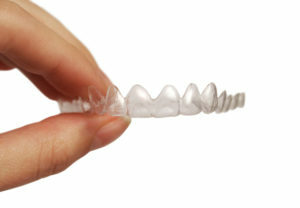 Instead, a series of clear plastic aligners are worn over the teeth to gradually move them into position. This provides a more comfortable and discreet solution that also offers a shorter treatment time. On average, you will have a straight smile in about 12 months. When compared to traditional braces, Invisalign offers exceptional benefits and convenience. Since the aligners are removable, you do not have to worry about dietary restrictions. You can still eat and drink whatever you like. In addition, oral hygiene is easy because you do not have to clean around wires and brackets. Overall, treatment is more convenient because you do not need adjustments so you will require less visits to the office. However, we will still need to see you every few weeks to monitor the progression of your treatment. Invisalign can be used to correct several alignment and bite issues; however, it cannot be used to treat large gaps or teeth that are severely rotated or tipped. To ensure you are a candidate, you will need a comprehensive consultation with your dentist in Columbia. Dr. Philip Batson will then take impressions of your teeth with 3D scans to create a series of aligners. You will wear each one for about two weeks before switching to the next in the series. You must be committed to wearing them for at least 22 hours each day, only taking them out when eating, drinking, and caring for your teeth. At the end of your treatment, you will require a retainer for a short period of time to prevent them from moving back into their previous positions. If you are ready to feel confident about the appearance of your teeth, it is time to see if Invisalign is right for you. At Columbia Healthy Smiles, we will give you the dazzling smile you have always wanted with a discreet and sophisticated solution. Contact our office today to schedule your appointment for the most preferred orthodontic treatment.